The Songbird has the distinction of being the 1998 Pinnacle winner for best accessory from the American Society of Furniture Designers. It has been editorialized in many magazines such as House Beautiful and Elle Decor. 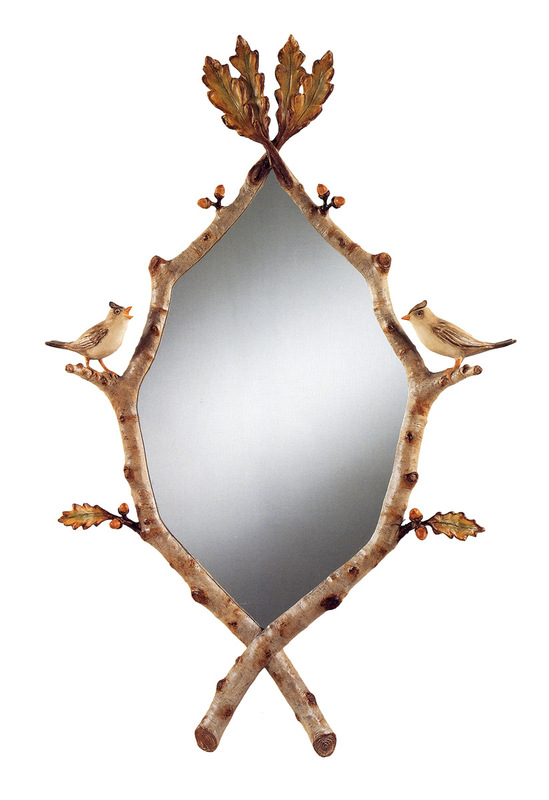 It's designer is Carol Canner who has created many of the mirrors for Carvers' Guild. The Songbird sings! From a perch of crossed oak boughs with leaves and acorns one tufted titmouse serenades another. A softly hand-painted finish captures this charming moment in nature. This exquisite Carol Canner design, one of our most popular, is equally brilliant in a hand-laid antique gold leaf finish.